Proportional Screw-in Cartridges with Slip-on Coil | Tucson Hydrocontrols Pvt. Ltd. 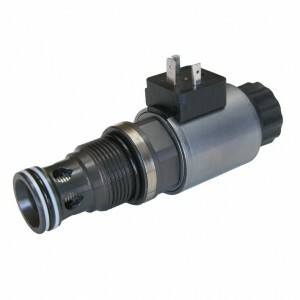 The exchangeable coil significantly simplifies the logistics, because the solenoid coil can also be retrofitted. The various alternatives make the proportional screw-in cartridges a very flexible system. Different plug – voltage alternatives are available ex stock and are complemented with respect to individual adaptations – with the customary Wandfluh flexibility. In addition, the performance of the valves has been increased by the improved solenoid coil. Therefore also ambient temperatures of up to 70°C can be accepted without any performance loss. With the improvement of the corrosion protection of the solenoid coil, depending on the version, the valves achieve a salt-spray resistance of over 500h. Available are valves with the standard cavities M22 and M33 in accordance with ISO 7789. Pressure relief valves are available as direct operated and pilot-operated versions up to volume flows of over 230 l/min and pressures of up to 350 bar. Apart from the optimised proportional throttle for volume flows of up to 63 l/min, the All-In-One valve QSPPM33 (tight seating volume flow controller) with mechanically preset Imin is in the Wandfluh product range. By the preset Imin the series spread of the valves is reduced to a minimum, in order to guarantee a simplification of the valve commissioning.